Embryologically, the muscles of mastication develop from the first pharyngeal arch. 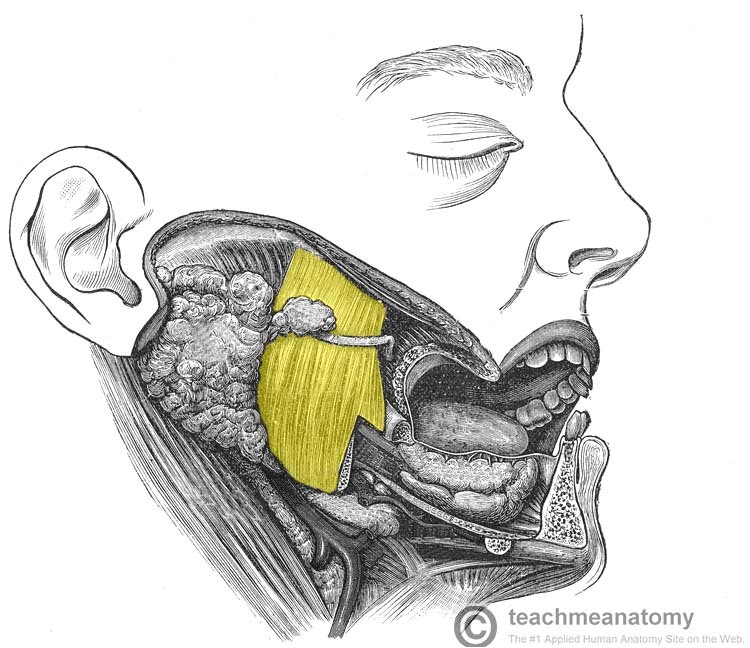 Consequently they are innervated by a branch of the trigeminal nerve (CN V), the mandibular nerve. In this article, we shall look at the anatomy of the muscles of mastication – their attachments, actions and innervation. 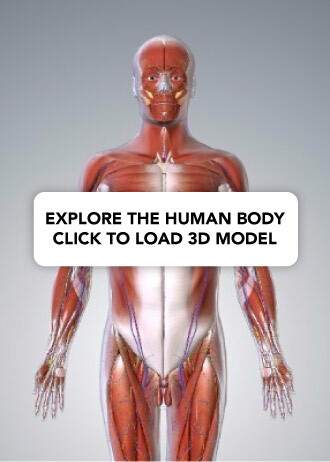 (NB: It is important to note that all the muscles mentioned here are bilateral structures). The masseter muscle is the most powerful muscle of mastication. It is quadrangular in shape, and can be split into two parts; deep and superficial. The entirety of the muscle lies superficially to the pterygoids and temporalis, covering them. Attachments: The superficial part originates from maxillary process of the zygomatic bone. The deep part originates from the zygomatic arch of the temporal bone. Both parts attach to the ramus of the mandible. Actions: Elevates the mandible, closing the mouth. 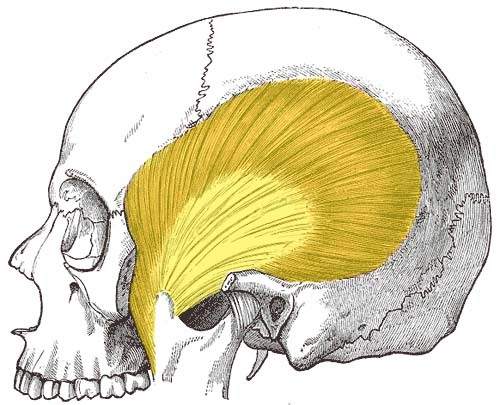 The temporalis muscle originates from the temporal fossa – a shallow depression on the lateral aspect of the skull. The muscle is covered by tough fascia which can be harvested surgically and used to repair a perforated tympanic membrane (an operation known as a myringoplasty). Attachments: Originates from the temporal fossa. It condenses into a tendon, which inserts onto the coronoid process of the mandible. Actions: Elevates the mandible, closing the mouth. Also retracts the mandible, pulling the jaw posteriorly. Fig 1.1 – The temporalis muscle. The medial pterygoid muscle has a quadrangular shape, with two heads; deep and superficial. It is located inferiorly to the lateral pterygoid. Attachments: The superficial head originates from the maxillary tuberosity and the pyramidal process of palatine bone. The deep head originates from the lateral pterygoid plate of the sphenoid bone. Both parts attach to the ramus of the mandible, near the angle of mandible. The lateral pterygoid muscle has a triangular shape, with two heads; superior and inferior. It has horizontally orientated muscle fibres, and thus is the major protractor of the mandible. Attachments: The superior head originates from the greater wing of the sphenoid. The inferior head originates from the lateral pterygoid plate of the sphenoid. The two heads converge into a tendon, which attaches to the neck of the mandible. Actions: Acting bilaterally, the lateral pterygoids protract the mandible, pushing the jaw forwards. Unilateral action produces the ‘side to side’ movement of the jaw. Fig 1.2 – The medial and lateral pterygoids. Which embryological structure do the muscles of mastication develop from? Which nerve innervates the muscles of mastication? What is the main action of the masseter muscle?